The President is due to visit the SGC in five days, and recently promoted General O'Neill has his hands full. Personnel files, bunting samples, and menu items demand his attention, Mark Gilmor, a new administrative aide, arrives at the base, as do quarrelling delegates from Amra, an alien plant from P6J-908 has been brought back for study by Dr. Lee, and SG-1 proposes a mission to P2X-887, which may hold weapons technology. O'Neill delays SG-1's mission, investigates the seedling in Dr. Lee's lab, locks the bickering Amrans in a room for a "time out," and, overwhelmed, begins to draft a letter to General Hammond. It's four days to zero hour, and SG-1 and SG-3 embark for P2X-887, but shortly after SG-1 rings into a secret facility, SG-3 comes under attack by an alkesh. Meanwhile, Dr. Lee's plant has grown to enormous proportions, and even a machete and a blow torch fail to hold it at bay. As O'Neill orders backup for SG-1, Ba'al appears as a hologram, claiming to have captured SG-1, and offering to exchange them for Camulus. Camulus is willing to leave Earth, and offers a gate address for his freedom, an address that leads to a ZPM. Suddenly, the base loses power as the encroaching alien plant infiltrates the walls, and O'Neill's letter becomes a resignation. 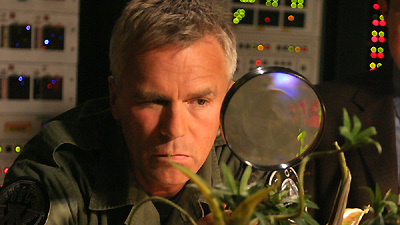 Zero hour approaches, and Dr. Lee eradicates the plant using gamma radiation, which also reveals an anomaly in the ZPM. It has been booby trapped and could have destroyed the planet. O'Neill sends Camulus through the gate to Ba'al, but the exchange is made and SG-1 is not returned. Suddenly SG-1 dials in under fire. They had never been Ba'al's prisoners, but had been trapped in the secret lab. Once they are safely returned, the SGC prepares for the President's arrival, and Gilmor confesses he has come to respect O'Neill's leadership. O'Neill leaves for the ceremony, having completed his letter of resignation: "Never mind." Mark Gilmor is a civilian who had been an analyst at the CIA for the last eight years, with top-level clearance, mostly doing background checks, before being sent on special temporary assignment as O誰eill痴 new administrative aide. P2X-887 had formerly been within Anubis痴 domain and held a secret base for which Ba誕l was searching, but which contains no significant defense technologies. The plant from P6J-908 grew from a seed to a plant in 20 minutes. By the second day it had spread beyond the lab to the entire level, showing resistance to both machete and blow torch. By day three it had entered the walls and shut down power and communication systems. It responds dramatically to visible light, but can be eradicated using gamma radiation. The ZPM, or zero-point module, is an Ancient power source that draws its energy from subspace and is the only thing powerful enough to activate the Ancient Defense Weapons found in Antarctica. SG-2 completed a mission to P8F-809. SG-3 accompanied SG-1 to P2X-887. SG-5 returned with the Amra delegates to discuss a pending trade agreement. SG-8 returned from P6J-908 with the alien plant. SG-10 and SG-12 joined SG-3 in the rescue mission for SG-1. Fourteen teams were currently off-world. O誰eill addresses the technician as Walter.